We’d love your help. Let us know what’s wrong with this preview of Introduction to Objectivist Epistemology by Ayn Rand. To ask other readers questions about Introduction to Objectivist Epistemology, please sign up. An excellent book for any human being with a brain and would like to know how to use it. Many philosophy books raise more questions than they answer and lead to more confusion than clarity. This is a very practical book because it establishes an essential foundation for all our thinking and how we relate to the world. Ayn Rand explains how we know the world is objective, why the senses are reliable, the importance of reason, and other issues related to epistemology (the science of knowledge). One An excellent book for any human being with a brain and would like to know how to use it. One of the most useful ideas in this book is the idea of concept formation and Ayn Rand's take on the "problem of universals" (whether concepts exist separately of reality or not). You can find my full review on my website, but in a nutshell, Rand was not well-schooled in philosophy and this book shows that very clearly. She has NO following among professional philosophers because of that. She has a HUGE following among readers of her novels, and when those readers find this book on OE they give it gushing reviews. And OE is probably the first book on a philosophical subject they have ever read. 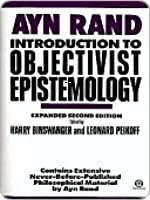 The main faults with OE: 1) Rand just makes claims, she does not present argum You can find my full review on my website, but in a nutshell, Rand was not well-schooled in philosophy and this book shows that very clearly. She has NO following among professional philosophers because of that. She has a HUGE following among readers of her novels, and when those readers find this book on OE they give it gushing reviews. And OE is probably the first book on a philosophical subject they have ever read. The main faults with OE: 1) Rand just makes claims, she does not present arguments, so she does not make a good case for herself: you have NO CASE if you just make claims that are unsupported, or are only mildly supported, 2) she is guilty of circular reasoning all over the book, as in when she defines "length". If you define "length" as "any item posessing length" you don't bring much to the table. These are errors made by first-year philosophy students. I know many sneer at the idea of Ayn Rand as a philosopher. (Just look at reviews below.) I believe mainly because they're so radically opposed to her views and so consider her a threat to their values. And many find it easy to be derogatory because she won fame as a writer of fiction and didn't have the academic credentials of those who usually call themselves philosophers. And sorry to say, it probably didn't help back then--may even hurt her now--that she was a woman poaching on very male ter I know many sneer at the idea of Ayn Rand as a philosopher. (Just look at reviews below.) I believe mainly because they're so radically opposed to her views and so consider her a threat to their values. And many find it easy to be derogatory because she won fame as a writer of fiction and didn't have the academic credentials of those who usually call themselves philosophers. And sorry to say, it probably didn't help back then--may even hurt her now--that she was a woman poaching on very male territory. All I can tell you is that the much-lauded Anarchy, State and Utopia by Robert Nozick, which won a National Book Award in philosophy and religion, basically takes Ayn Rand's political arguments and presents them in academic language and is by someone with those academic credentials--and it's awarded respect. But if any aspect of her philosophy has some grudging acknowledgement from philosophers, and is truly original, it's probably her epistemology. Epistemology is that branch of philosophy that deals with knowledge--its nature, what can we know, how do we know it. Once, when Ayn Rand was asked to define her philosophy while standing on one foot, she replied: "Metaphysics: Objective Reality; Epistemology: Reason; Ethics: Self-Interest, Politics: Capitalism." Well, I might take issue with "capitalism" as the name of a political, rather than economic concept, but otherwise that's summarizes her beliefs well. But then a lot of philosophers might define themselves similarly. What makes a philosophical system are the details and the arguments. In the case of epistemology this book actually has a pretty narrow focus--though a crucial one. The original edition was not much longer than 100 pages--a very slim mass paperback. Peikoff has added to it material from taped lectures. Basically, this focuses on the nature of concepts and especially concept formation and how that feeds into consciousness and identity. This book is very basic - but was very difficult, for me at least. I found myself not able to make every logical jump Rand thought proper. A little weird, since I agree with so much of what Rand says. I don't think I ever actually finished the book, since I could not agree with some pretty fundamental jumps she made. I've read Atlas, Fountainhead, We the Living, Anthem, Night of Jan. 16, Capitalism: the Unknown Ideal (my favorite of hers), Virtue of Selfishness, and several other books of her ess This book is very basic - but was very difficult, for me at least. I found myself not able to make every logical jump Rand thought proper. A little weird, since I agree with so much of what Rand says. I don't think I ever actually finished the book, since I could not agree with some pretty fundamental jumps she made. The terms and arguments are completely unclear. If this is an attempt at rigorous philosophy, it falls embarrassingly short. As one who actually agrees with Ayn Rand in broad terms, I am consistently disappointed by the quality of the arguments she marshaled for her beliefs. This book by novelist and philosopher Ayn Rand, (author of "Atlas Shrugged" and "The Fountainhead") establishes the foundation of the philosophy of Objectivism, putting forth a clear statement of the branch of epistemology, and specifically, of concept formation. Rand connects every concept, no matter the complexity of the abstraction, to objective reality, proving that all concepts are in fact measurable and objective, including complex emotions such as love. This is a very technical book that This book by novelist and philosopher Ayn Rand, (author of "Atlas Shrugged" and "The Fountainhead") establishes the foundation of the philosophy of Objectivism, putting forth a clear statement of the branch of epistemology, and specifically, of concept formation. Rand connects every concept, no matter the complexity of the abstraction, to objective reality, proving that all concepts are in fact measurable and objective, including complex emotions such as love. This is a very technical book that may take the student several reads to start to grasp, but it is essential for understanding Objectivism, and learning to fully integrate the philosophy into one’s life. Whether one is a philosopher or a student of Objectivism, this book can help one to achieve the clarity of thinking required to have a successful and happy life. What an angry, bitter, sarcastic, sophomoric screed. Fascinated by Plato's cave wall discovery of abstractions she declares that only "man" is capable of reason. I suspect squirrels can discern 'this is a tree', 'this is not a tree'. [stupid]sic... are those who desire to escape from the absolutism of existence, of facts, of reality, and above all identity." The essence of her argument that reality is reality. Your subjective perception is only correct if it perceives the one single correct defi What an angry, bitter, sarcastic, sophomoric screed. [stupid]sic... are those who desire to escape from the absolutism of existence, of facts, of reality, and above all identity." The essence of her argument that reality is reality. Your subjective perception is only correct if it perceives the one single correct definition of reality. The word "Justice", the example she uses, has one correct axiomatic meaning. Some I suspect my definition of justice is different from hers. My understanding of the word justice my involve fairness and equality. Her idea of justice I suspect involves mostly property rights. Her form of logical argument is to ridicule and mock those who wander from what is obvious to her and suggest more nuanced ideas. Ayn Rand is such an incredibly lucid thinker and writer. And her style has got to be the most male of any writer I know. Probably one of the most important book to read for understanding Objectivism, but also the most technical, requiring multiple slow reads. In terms of recommendations it's a bit of a tossup; if you are new to Objectivism I can't recommend it yet. But you cannot have a full, proper understanding of the philosophy without it, so if you have read her other nonfiction I recommend you give it a shot. Second edition is a must; it has a ton of supplementary material that really help you understand the c Probably one of the most important book to read for understanding Objectivism, but also the most technical, requiring multiple slow reads. In terms of recommendations it's a bit of a tossup; if you are new to Objectivism I can't recommend it yet. But you cannot have a full, proper understanding of the philosophy without it, so if you have read her other nonfiction I recommend you give it a shot. I read this after a Computer Science class that emphasized the importance of concept-formation and using consciously building the structure of one's own knowledge. I found it very intellectually stimulating, especially her her perspective on language, how the cognition happens before we communicate. This is a tougher book to read but well worth the effort. Just don't think this is as well-written as Rand's other works. Seems to ramble on in most spots without Rand's usual sharp precision in making her points. Not my favorite Rand book for sure! This review has been hidden because it contains spoilers. To view it, click here. This book—in part—saved my Life. Thank you, Angelica. This book proves that knowledge is hierarchical. Knowledge is organized into concepts, and each concept has (a) a definition and (b) what it refers to. It was valuable reading to me, as a computer programmer, since data organization is a big part of programming. The understanding that knowledge is hierarchical seems trivial, but the real difficulty is understanding if properties of a thing are part of the thing or assigned by us. For example, what makes an apple an apple? Does the taste of the a This book proves that knowledge is hierarchical. Knowledge is organized into concepts, and each concept has (a) a definition and (b) what it refers to. The understanding that knowledge is hierarchical seems trivial, but the real difficulty is understanding if properties of a thing are part of the thing or assigned by us. For example, what makes an apple an apple? Does the taste of the apple belong to the apple, or is it something that we attribute to it? One school (idealists) says the taste is inside the apple, another (empiricists) says that this property is subjective. You may think that this is a funny argument, but the first school reaches the conclusion that there is another world that contains the "soul" of all apples, and the second school concludes that we can't be certain of anything, since every property is subjective. This dispute started with the ancient greeks and was "resolved" by Emmanuel Kant with the idea that the apple (and all things) is a "holographic" projection of our brain given some input data from another dimension, so we can be certain about our knowledge of it since we have created it ourselves rather than discovered it. Although this "resolution" has inspired among many things the movie "The Matrix", Ayn Rand resolves the issue properly with this book. The apple is what it is, but we create a concept of an apple by observing similarities between many apples. They all have the same taste, shape and other properties, so the idea of an apple, the "soul" of the apple, is conceptual and lives in our brain (not in another world). Moreover, this concept of an apple is not subjective, because it was based on observation of real apples. So what is the benefit of this theory to someone like me, who is not a hard-core philosopher? First I learned the principle by which a child learns things. Second, it discusses the concept of zero and infinity and their status in mathematics. Third, it characterizes what are definitions. Fourth, the book identifies something called invalid concepts, which have no right to be in the knowledge hierarchy because they can't be traced back to reality. An example of invalid concept would be "ethnicity" which is a kind of racism, but not really because it involves tradition (see http://aynrandlexicon.com/lexicon/eth...). In all cases, anti-concepts can't be traced back to reality. For example, another anti-concept, "duty", can be traced back to mystic obedience and has no basis in reality. (see http://aynrandlexicon.com/lexicon/dut...). The correct concept instead of duty is causality -- people do things because there is a reason to do them, not because of a command from someone else. Duty actually denies causality, and as a result, based on the invalid concept of duty, people did very crazy things. I am having trouble rating this book. For one, I really liked it (in the same way I like the movie "The Room"), but on the other hand, the content itself is quite bad in terms of writing, in terms of clarity, and it lacks rigorous formal arguments. So I'll just compromise on a 2.5 rounded down. Ayn Rand has a serious problem making clear when she's talking about what is, and what ought to be. After reading the first eight chapters I assumed that she was mostly talking about the latter, because ot I am having trouble rating this book. For one, I really liked it (in the same way I like the movie "The Room"), but on the other hand, the content itself is quite bad in terms of writing, in terms of clarity, and it lacks rigorous formal arguments. So I'll just compromise on a 2.5 rounded down. Ayn Rand has a serious problem making clear when she's talking about what is, and what ought to be. After reading the first eight chapters I assumed that she was mostly talking about the latter, because otherwise this whole things needs some pretty darn huge  stickers. I mean, she keeps talking about concept formation, but is she talking about it in the abstract? Or is she actually trying to ground it in real-life human cognition? It shouldn't be the latter because she doesn't offer any supporting evidence from the cognitive sciences, any way to test these claims, you know, stuff that any serious person who makes claims about the real world should provide. But then again, I'm no Randian apologist so what the hell do I care? For someone who's interested in Artificial Intelligence, you have not to just be acquainted with Epistemology, but to have a deeper understanding of this topic because if you don't understand what knowledge, consciousness, wisdom, experience, intuition, salience, and intelligence are, then you are not ready for the real challenges of AI. Although this book by one Ayn Rand sure isn't the best book for you to grasp all of what Epistemology has to offer, it is still the best book if you need a smart For someone who's interested in Artificial Intelligence, you have not to just be acquainted with Epistemology, but to have a deeper understanding of this topic because if you don't understand what knowledge, consciousness, wisdom, experience, intuition, salience, and intelligence are, then you are not ready for the real challenges of AI. I liked the ideas presented in this book. If you like Aristotle's ideas, you will too. Although I haven't evaluated other epistemic philosophies any more then reading the Wikipedia pages, after reading this I don't think I would pick any other over the Objectivist one. Rand presents her system in a clear way along (simplistic) relevant mathematical ideas. 'Concepts' are abstractions that serve as shortenings for longer descriptions of truly-existing things in the world. Concepts simultaneously i I liked the ideas presented in this book. If you like Aristotle's ideas, you will too. Although I haven't evaluated other epistemic philosophies any more then reading the Wikipedia pages, after reading this I don't think I would pick any other over the Objectivist one. Rand presents her system in a clear way along (simplistic) relevant mathematical ideas. 'Concepts' are abstractions that serve as shortenings for longer descriptions of truly-existing things in the world. Concepts simultaneously integrate sub-concepts and differentiate from other, neighbouring concepts. Think of the organizations of concepts as a lattice (wikipedia). I have to admit I only read Ayn Rand's portion of this book and not the "additional" material from the new edition. I started the first of the additional material and it was all repetitive of what Rand wrote. I also found the interview/workshop material to be rather redundant. I am not a Rand follower, believer, whatever. Within the past year I read Atlas Shrugged and while overall I liked it, I find her work redundant. I think that book could have been at least a third of its size if edited down I have to admit I only read Ayn Rand's portion of this book and not the "additional" material from the new edition. I started the first of the additional material and it was all repetitive of what Rand wrote. I also found the interview/workshop material to be rather redundant. I am not a Rand follower, believer, whatever. Within the past year I read Atlas Shrugged and while overall I liked it, I find her work redundant. I think that book could have been at least a third of its size if edited down so it didn't repeat so much! I felt the same with this. A lot of her points are repeated, and I don't necessarily think for emphasis or clarity. It is as if she likes to hear herself talk -- in writing. Same stuff over and over. I kept thinking: I get it already, move on! VERY different from anything I've ever read!! Ayn Rand's book gives you a guide to the how's of concept-formation, propositions, and many other topics. The mind is a very complex thing and Rand tells the reader her ideas of how it works. I especially loved her use of examples such as the evolution of the definition of "man" and her explanation on the question "Can you measure love?" A fascinating book, to say the least! I would recommend the main text, but slogging through the appendix dragged out the book considerably. There's a lot of good material in there, but most of it was essentially wasted on me. Someday I'll have to reread this, but I knew that going in. This book is, like it says on the tin, only an introduction. A full investigation would be nice, but Rand herself acknowledged a lot of unfinished work, so the Appendix is about as close as we're likely going to get to that. Going into this book, I expected a rough layout of all of the things that made Rand's philosophy unique. Instead, the first 7 chapters consisted of lessons in basic cognitive development, and the last remaining chapter consisted of her spewing out everything that is apparently wrong with Immanuel Kant, instead of explaining why her philosophy differs, and why I should be persuaded into agreeing with her. Poor show. Dry writing style. A very important book, but not for those who are new both to Ayn Rand's ideas and to abstract philosophy. ITOE focuses specifically on "the problem of the univerals," laying out the relationship of conceptual knowledge to concrete reality. This is an important part of philosophy, and Ayn Rand provides real solutions, but unlike most of her work, ITOE does little to provide context for the layman, and therefore I don't recommend it to the average reader. 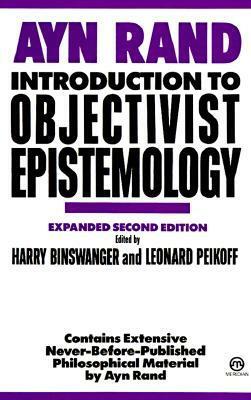 Epistemology is a theory of a philosophical knowledge. It engaged how our minds are related to reality, whether the state of affair are valid or invalid. It teaches men how to communicate, and how we see things the world around us. It is the explanation of how we think by determining a proper method of evaluation.